I want to start off by saying that I know this was not a required assignment, or an assignment at all. However, I feel like I got a lot out of this course, and I wanted you (Professor Drew) to know what I was able to gain from this class and the projects we’ve done. I have always been a fan of movies and tv shows, but in the recent years, my interest has deepened. I think part of my interest had to do with my fascination in and desire to tell stories. I was always in awe of large-scale movie sets and high-quality cinematography, but I never gave much thought to how certain shots were taken or how a specific scene was framed. This class gave me the ability to see those techniques and to identify them with the correct terms. Now I’ll hear a door slam or footsteps going up the stairs in a tv show and movie, and I’ll realize that the noise didn’t come from an actual door and the footsteps weren’t real, but they were sound effects edited in during post-production. I’m a fan of Hindi films, so that is predominantly the cinema that I watch. One of the great things that I’ve noticed is the universality of movie-making. Whether in the East or the West, many of the core techniques and functions remain the same. Not only can I apply what I’ve learned to the many American tv shows that I watch, but also to the Bollywood movies to which I have always been a dedicated audience member. When I listen to interviews of directors from the Hindi film industry, I have a deeper understanding the terminology that they use, because of this class. One director, while explaining his process, says that he never creates a story board until the set is fully designed. While he was talking about his pre-production process, I was able to relate (on a smaller scale) because now I’ve had the experience of making a few short films. So not only has the techniques and terminology you teach us in class benefited me, but also the hands-on experience. Although stressful at times, mostly during shooting footage, it was a great learning experience and an enjoyable class. Thanks for doing what you do and for being so passionate about films and film making! For my final film, I’m doing a documentary on how the recent events in the news has affected the Muslim community, especially on campus. I will be interviewing 5 Adelphi students about their experiences and thoughts about the prejudice and discrimination, as well as the some of the positive outcomes that occurred in response to Donald Trump’s comments about banning Muslims from this country. One girl who I was very interested in interviewing for the documentary told me that her parents were very uncomfortable with her being a part of this documentary, which I assured her would only be shown to this class, because they worry that much about her safety. They have asked her to take off the hijab, a part of her religion that she is unwilling to compromise, and now limit her from going out unnecessarily because they fear she will be attacked in some way. I will blur her face in the documentary and will not use her name, but her story is a primary example of why this documentary needs to be made and will be the focus of the documentary. How do you think recent events in the media have affected Muslims within the past few weeks? Do you have any personal experiences in which you fear for your safety because of your religion? What would you tell someone who has prejudices or fears about Muslims or the Islamic faith? Have you ever been discriminated against because of your faith? For B-roll, I will be shooting footage of different things that represent the Muslim faith: a woman putting her hijab on, someone praying, etc. I am also thinking about filming some footage inside of a mosque. I filmed one AU Sapna dance practice and I will be interviewing people today and tomorrow. 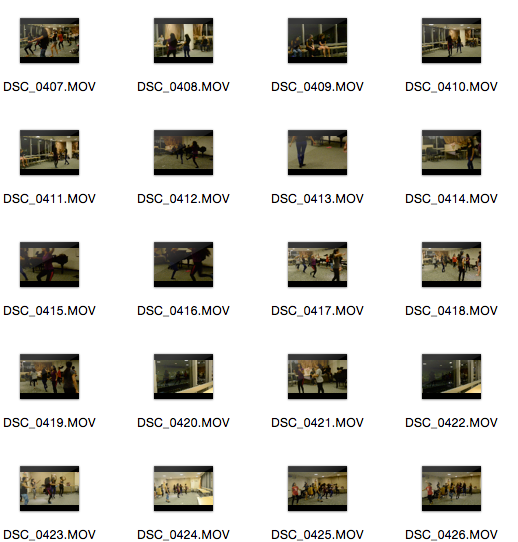 I’ve included a picture of the thumbnails of the footage I already shot. I was unable to upload the actual files. This week I chose to watch “Outfoxed: Rupert Murdoch’s War on Journalism.” Today, I don’t think there are many logical people that watch Fox News or take what they have to say seriously. Even if they do, they know that the network is not “fair and balanced” as they have portrayed themselves to be in the past. However, I read that when this documentary was first released, people were not aware of the ways in which Fox and its news division disguised their bias. Because it was, at one point in time, such a controversial and revealing documentary, I decided to watch it. As someone who is passionate about journalism, this documentary also intrigued me. The documentary was a success in exposing the bias views of Fox News and the ways in which they try to disguise their personal or corporate views as fact or journalistic reporting. Because of the subject of the documentary, most of the film, aside from the A-roll interview footage, relied on b-roll of different Fox News segments and clips. One of the most interesting things that they included as B-roll were the memos that were passed down from the executive heads of Fox to the members of the news division. They also creatively filmed A-roll (or what seemed like A-roll) of interviews with anonymous sources. Instead of filming their faces or bodies, they recorded the machines that their interviews were being played back from. It was very effective in its execution, and I don’t think there was anything in the documentary that could made it better. They had sufficient interviews with former Fox employees, as well as numerous clips that proved the points that they were attempting to making. With a general, large topic, they broke it up into segments that flowed together well and provided cohesion between the different ideas. It was interesting and engaging for the entire length of the documentary. Watching it make me understand why it was such a breakthrough when it was first released. For this week’s assignment, I watched the documentary “Steve Jobs: One Last Thing,” which tells the story of how Steve Jobs became the legendary man that he was and the legacy that he has left behind. I learned a lot of information that I never knew about Steve Jobs. I never knew that he was a part of the animation film studio, Pixar. I wasn’t aware of his relationship with Bill Gates, which was covered in great detail in the documentary. I also did not know that there was a point in time when Jobs did not work for Apple. Today, he is seen as such an iconic, successful man, so one does not think that he has experienced much failure, but the documentary also touched upon certain failures that he experienced. The documentary also gave credit to Steve Wozniak, who was portrayed as the brains behind the operation, with Jobs playing the role of the creative salesman and marketing genius. I had never even heard of Steve Wozniak before this documentary. The documentary was purely about his career at Apple, so it didn’t cover much of his personal life, which also shapes who a person becomes. We’ve all heard various stories about his personal life or the way that he used to go about a normal day, which was not discussed at all during the documentary. Perhaps it would have been more entertaining, and more impactful, if those details were included. Although most people in our generation know all of the ways that Steve Jobs and Apple have revolutionized our world in terms of technology and music, it never registered how much he had changed those fields until I watched this documentary. There is one comparison at the end that one of the interviewees make between Thomas Edison and Steve Jobs, and he basically stated that Jobs revolutionized more industries than Edison, which is a fascinating comparison to think about. In history, Edison has been regarded as such an important figure, but is it possible that Jobs was even more game-changing? Our disadvantage is that we were born around the time of the change and we grew up around iPhones, iPods, MacBooks, etc. However, in history, this documentary made me believe that Jobs will be regarded as an even greater inventor and innovator. It was inspiring, impactful, and a great way to tell the professional story of Steve Jobs. Aside from the lack of details of his personal story, they did a good job of getting a variety of interviewees who knew Jobs well or had some connection or expertise on him and representing his professional life. The most moving part was seeing the legacy that he has left behind and the way that he has touched so many people’s lives.